At the center of the Commonwealth you'll find Diamond City, where rumors and paranoia rules the day. 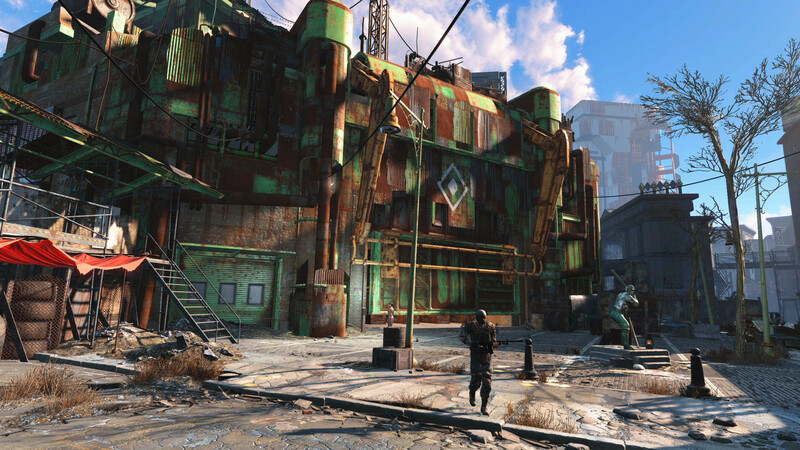 The greatest fear in the Boston wasteland aren't raiders or super mutants, but the dreaded Institute synths. These synthetic people are indistinguishable from real humans, and nobody knows why they're replacing ordinary citizens all along the coast. The Railroad is looking for answers. See how to join this sneaky group with the full guide below. Master the Commonwealth with some advanced tips and tricks straight from The Escapist, check out our Fallout 4 Survival Guide and learn how to manage your settlements like a pro, along with tons of other tidbits you might not know. To join the secretive 'Railroad' faction in Fallout 4, you'll need to start the 'Road to Freedom' quest. The Railroad, unlike the other major faction, the Brotherhood of Steel, relies on spy tactics instead of overwhelming military force. If you prefer to sneak and work with rag-tag revolutionaries trying to do the right thing in the Wasteland, the Railroad is for you. To acquire this quest, you'll need to enter Diamond City. Ambient conversations and rumors will unlock the quest as you explore the city. The quest doesn't tell you exactly what to do. Instead, you'll need to know something about the history of Boston and follow the clues. 1. Travel to Boston Common. It's a park east of Diamond City. The park is right next to Park Street Station -- the same area you'll enter on the main quest 'Unlikely Valentine'. 2. Talk to the Tour Bot near the statue. Look at the ground -- there's a brick path leading out and around the city. This is the famous 'Freedom Trail' and leads to multiple historic sites. At the front of each site, you'll see a number and a letter. 3. Keep track of these numbers and letters as you follow the brick path. Sometimes the path is obscured by debris. Watch for extra red paint lines that will help guide you. 4. The final stop on the trail is Old North Church. Old North Church is located northeast of Boston Common. 5. Enter the church basement. There's a catacomb with a strange dial at the end of the path. Here, you'll need to turn the dial clockwise or counter-clockwise and input a code. 7. Turn the dial and set the indicated letter in this order. Press the center button once the letter is set. Once all eight letters have been input with an individual button press, the hidden door will open. 8. Speak with the people down the hidden path, and agree to take their next mission. This starts the 'Tradecraft' quest with Deacon. Complete this job to formally join the Railroad, and gain Deacon as a companion.